Experience the delight of walks with your dog. We believe that enjoyable daily walks can promote behavioral well-being and mental health for both the pet owner and their dog! Are you struggling to walk your dog? Are you tired of your dog pulling and dragging you around? Walking nicely is a life skill that when missing can significantly and negatively impact the human-canine relationship resulting in fewer walks, less exercise and a decrease in social exposure for the dog. 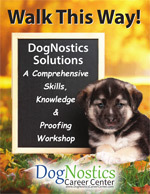 For this reason, DogSmith offers this DogNostics developed program called "Walk This Way" A great fun workshop options to support you and pet dogs in developing these much-needed skills. 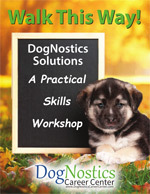 Register now for our Walk This Way DogNostics Solutions Workshop! During this fun 4-hour workshop you will learn lots of skills that will help you teach your dog to walk nicely on a loose leash, making walks less stressful and more enjoyable for both you and your companion! Register now for our Walk This Way Games, DogNostics Solutions Workshop! During this fun 1-day workshop you will take part in lots of fun games that will help you proof your dog’s loose-leash walking skills and improve your training mechanics, making walks less stressful and more enjoyable for both you and your companion!